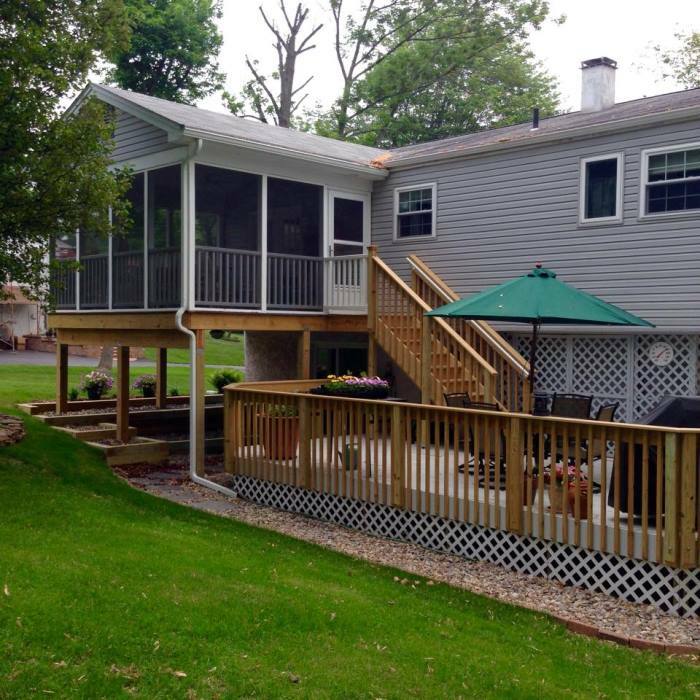 Susan and Mark chose Trexx decking in the “Treehouse” color for the porch floor. It looks great and is super low maintenance! 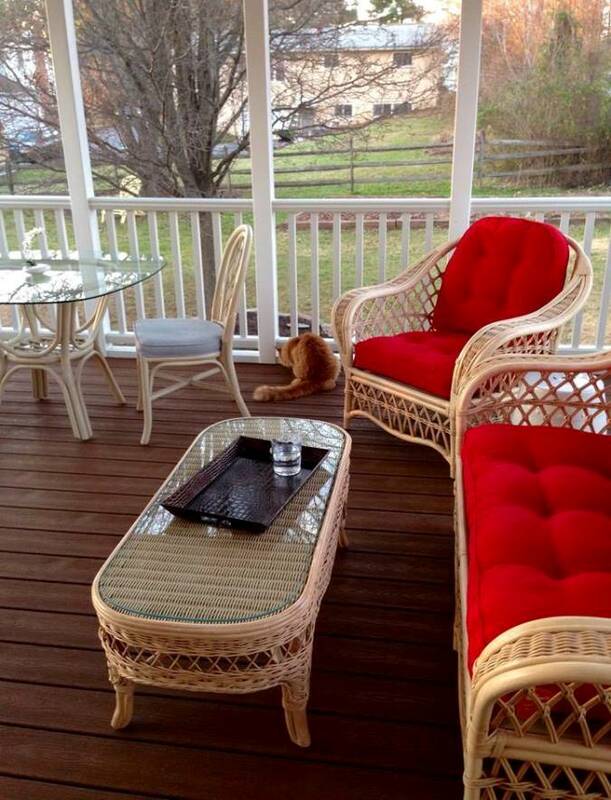 Susan found beautiful, vintage, rattan furniture on Craig’s list and was able to furnish her porch with a comfy seating area and a dining table with chairs for a fraction of what buying new furniture would have cost. Love the view! How wonderful would it be to sit here and look out on the garden! 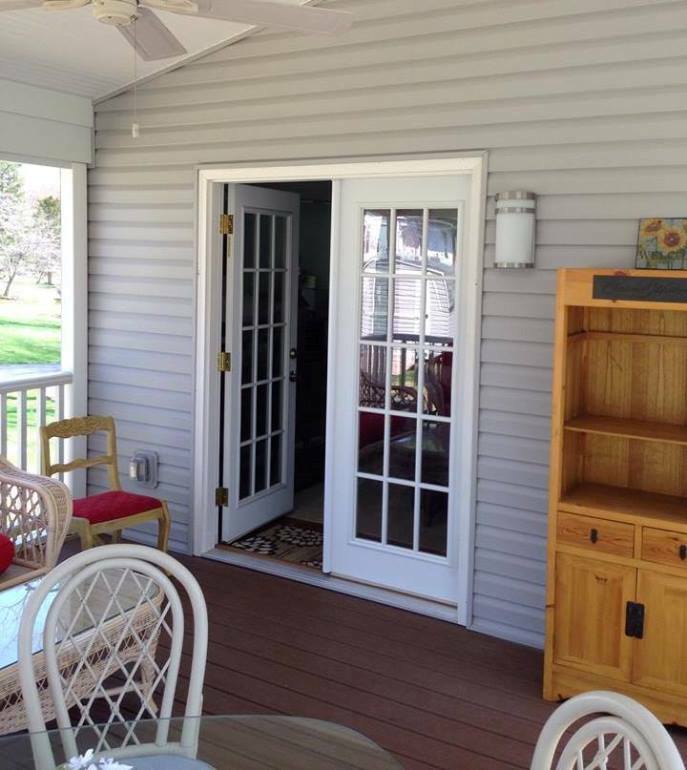 When adding on a porch, if you have enough space I definitely recommend French doors. I had French doors leading out to a patio in my second home and I loved throwing them wide open on pretty days. Susan found this beautiful rug in Pier 1. I love it and it looks like I’m not alone! 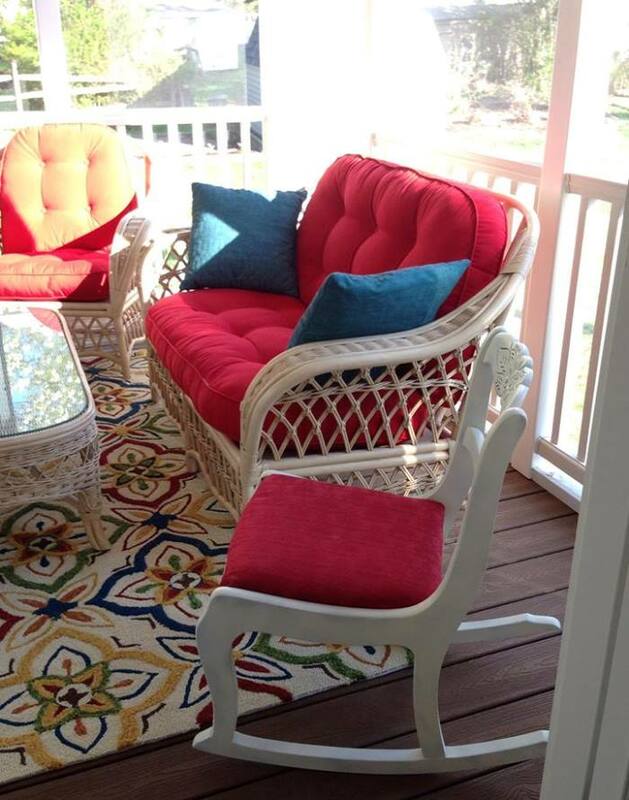 Thanks so much to Susan for sharing these pictures of her wonderful screened porch. It turned out beautifully! What a wonderful place to relax and enjoy each day and I know it will inspire others who are thinking about adding on a screened porch to their home. 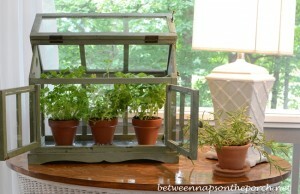 If you’ve added on a porch to your home, I would love to see it! Email me 5-10 large, clear pictures ([email protected]) and if possible, I’ll share them here at BNOTP! Oh, happy days! You will enjoy your new porch so much…we live in ours and especially love being “outside” in the rain! 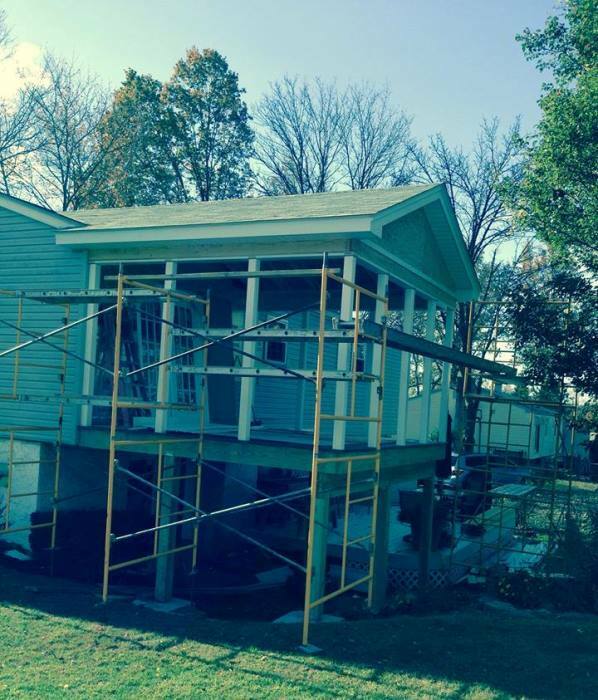 Several years ago we add a covered porch onto our house. We use it all the time. Even in winter we go out with blankets and sip hot cocoa while watching the snow. In summer we thrill to see the hummingbirds. We even had a nest under the eaves for about 6 years. this year we also redid our floors with composite decking and I must say it is the best investment ever. We love it and it looks beautiful. Love your blog, Susan. I have been following you for a long time and never tire of your creativity. So excited for your trip to Italy. Have fun. Aw, that’s great! So glad Susan and Mark took the plunge and built their porch. Doesn’t that make you feel good, Miss BNOTP? You got credit for being their inspiration! That’s awesome. And the porch looks so inviting. This is a “must have” for our next house. We could use it most of the year and every season would be wonderful, I know. Thanks to all of you for sharing the pics. It looks great! Hello Susan-we built our screened porch about two years ago, and absolutely love it. Here in the Midwest, it is just warming up to porch season! We are having some work done on our adjoining patio in the coming week or so, and I will be cleaning and opening up the porch once that is complete. I will send photos once I have the porch ready for the season. I wish I would have found your site before we built, as it definitely would have been a wonderful inspiration! What a compliment to you and BNOTP that your porch was Susan’s inspiration!! That little feather will look nice in your cap! Her porch turned out wonderful. I bet her cats want to lounge out there all of the time. It looks so relaxing and her wicker furniture is beautiful. This is something they will enjoy for a very long time. You are such a good influence on us groupies!!!! Adding our screened porch was the best thing we have done in this house yet (and we have done a lot). There was no place to just “be” before, and now I spend as much time as possible out there. Your porch inspired me, too, although mine looks nothing like yours or this one. My two favorite times of the day are very early morning, listening to the birds, and in the evening, listening to the crickets chirp and watching the lightening bugs. 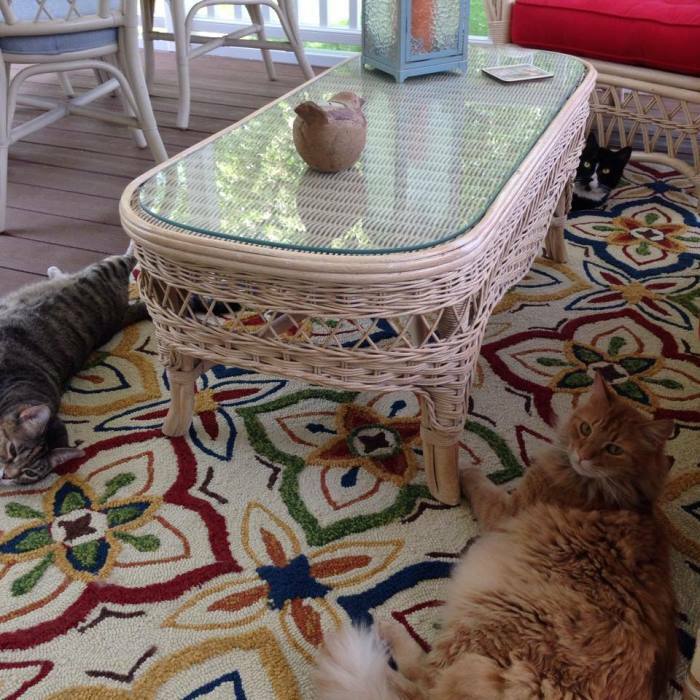 Awe; there’s nothing better than a screened in porch with a bunch of sweet kitty cats!!!! 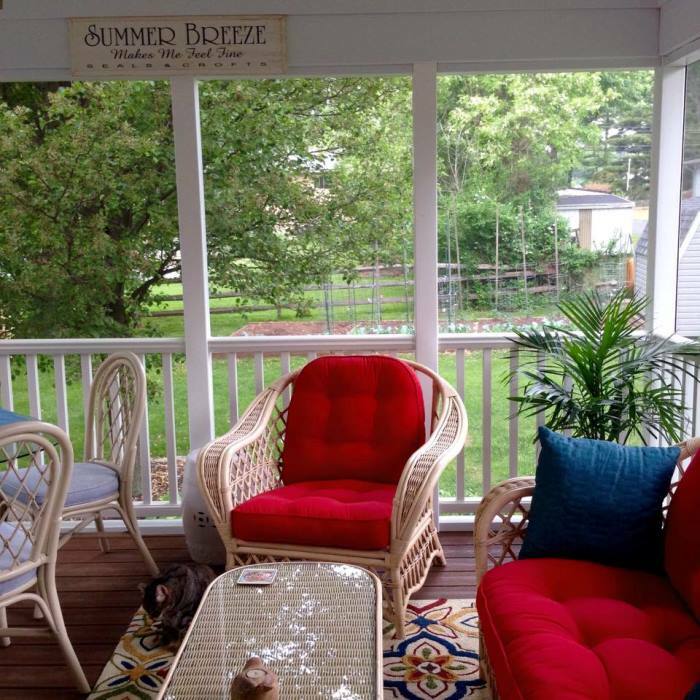 When I saw the “summer breeze” sign in the first picture, I thought you’d gotten new furniture for your porch! I honestly luv your porch, we have a great cape cod style porch, but it is not screened, and the dust and leaves keep blowing in. I think I am going to do screens. 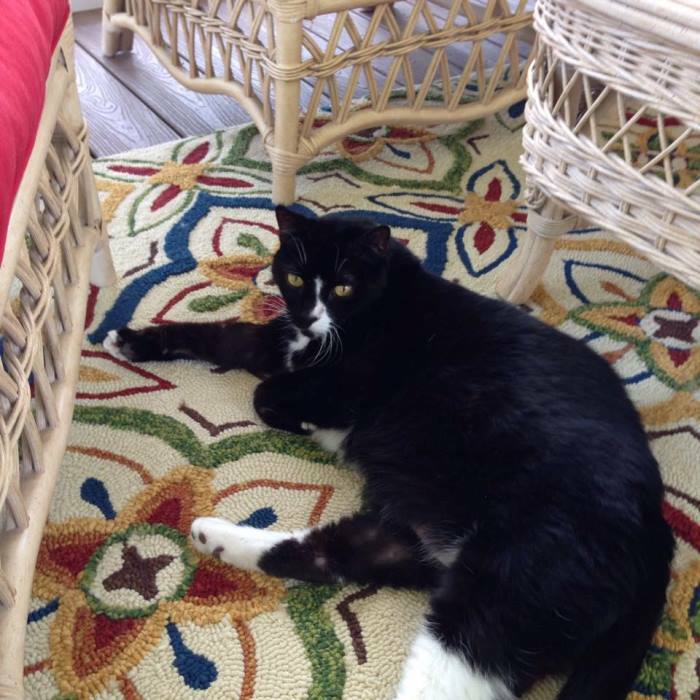 I am thinking your screened porch belongs to the cats–they really enjoy it. 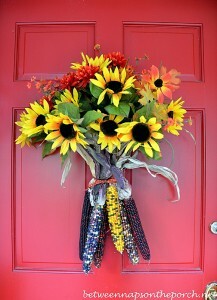 beautiful job, and way to go YOU, Susan for inspiring her porch. Another great BNOTP post! Hi Susan! 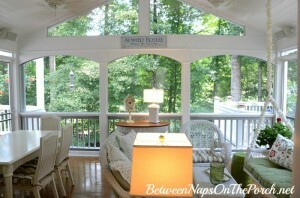 Thank you for sharing with us Susan and Mark’s screened porch. It looks wonderful and how nice to know yours was the inspiration. Your porch is so lovely! Thanks for popping in to see me and I do hope you’re doing well. I’m so happy for you that you’ll be seeing your little grandchild. I know you’ll cherish your time. Kudos to you Susan! I would love to screen in our back porch. I have to say with the many varities of bugs especially with the cicadas that my grandog is feasting on it would be great to separate myself from nature just a wee bit more. The loud crunch he makes chewing them is reason enough to not go outside now! Where could I find that beautiful summer breeze sign ?? Or the stencil ? Linda, I found the one that’s on my front porch at A Classy Flea but I’ve also seen them available online here: http://www.sawdustcityllc.com/summer-breeze-makes-me-feel-fine-seals-crofts/ They have them available in lots of different colors, too. Thanks SO much! Wonder if that’s old apple green and summer white ? I want to order the same colours….so many to choose from! Linda, I just emailed Susan so I’m sure she’ll reply. I know what you mean, there are so many colors to pick from at that website. I bought mine in A Classy Flea and they only had one so I didn’t have to choose. You can see it in blue in this post: https://betweennapsontheporch.net/make-a-patriotic-party-banner-pottery-barn-inspired/ I’m guessing mine is either Baby Aqua or Baby Blue, but I’m not sure. I love the Apple green, too! Oooohhhh! I love that too! Thanks so much , now I may want blue….lol. Now, I’m emailing them to see if they deliver to Canada. Thanks for the help ….. And I really like your site! Well Susan you apparently inspired many pf us Pennsylvania gals with your porch. My Pennsylvania porch story is the same as Susan’s. We had the same issue with builders until we asked the concrete contractors who we hired to replace our driveway. He is awesome and came with a very reasonable price so we figured that he must hang out with similar type contractors. Turns out we were right. He recommended a builder and we just loved him. I used ideas I got from you and he built our 11 x 22 screened in beauty. I even have the same Hunter ceiling fans that you have. 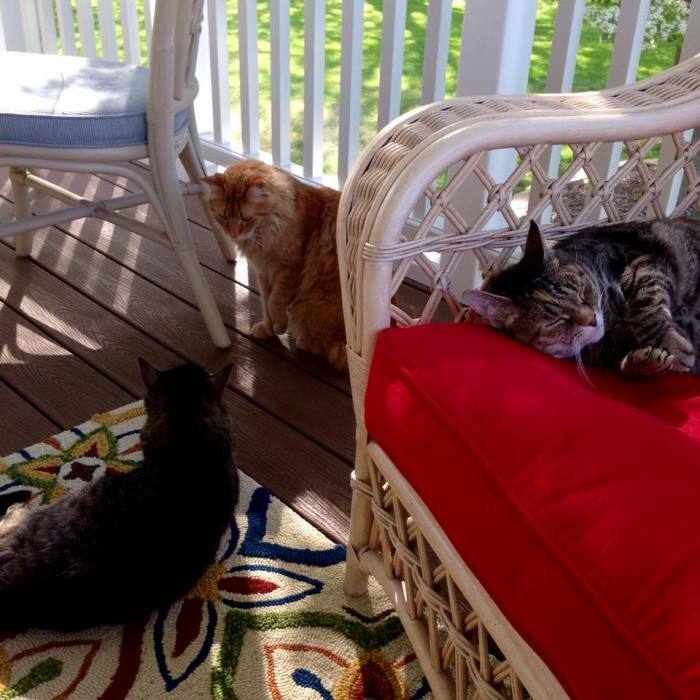 Like Susan in PA, my four fur kids love their porch! Thanks for sharing Susan’s story! Great post! 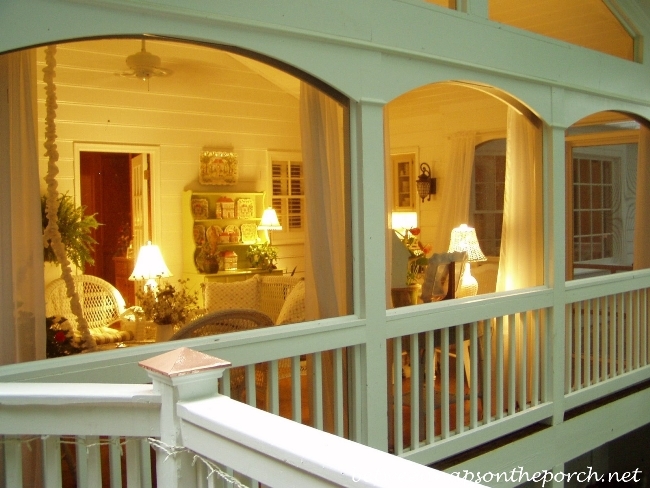 There is nothing more peaceful than a wonderful porch in my opinion! Enjoy! Enjoy! I love my country porch on my farm! I have been very blessed! I appreciate it! Love the cats enjoying it too! Ahhhh! Animals are truly little heavenly creatures sent to us from God! 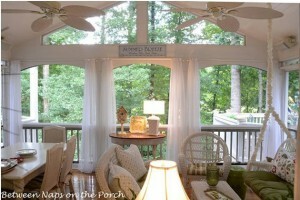 The new porch you featured on today’s post really is a beauty. I must say though, it wouldn’t be half as nice without those furbabies laying around enjoying themselves. Real beauties. I’m so glad you told us where she got that rug.mI LOVE IT!!! I’m going to check our their website pronto. I’m typing this while sitting in our screened in porch. I don’t know what I would do without it. When the weather is nice, it’s my favorite place to be. Unlike most, it’s located in the front of the house. We had a deck added two years ago in the back with trex treehouse also and we are so happy with it, and I do wish part of that was screened in as that is where we eat if it’s nice, but it wasn’t in the budget.